Comparing Amazon Web Services (AWS) to GoDaddy is like comparing apples to oranges. Or like comparing the space shuttle (AWS) to a commercial airplane (GoDaddy). They’ll both get you around the world, but one is way more complex, with a lot more potential, while the other is very approachable. GoDaddy is simplified for beginners, Amazon Web Services (AWS) is for developers and advanced users. Note: As of 2/25/18 you can get GoDaddy Managed WordPress Hosting for just $1/month with this link (a special GoDaddy Managed WordPress Hosting coupon). This is a SCREAMING DEAL and is not expected to last very long. When you’re comparing AWS and GoDaddy pricing, the thing to know is that they price way differently. 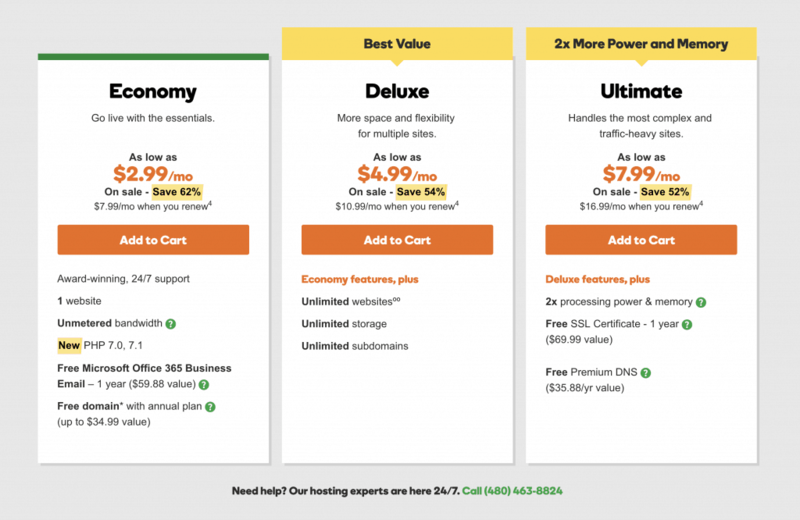 GoDaddy charges a fixed monthly cost, as low as $1 a month, with promotional pricing. AWS offers multiple options – both by the minute and fixed price with Amazon LIghtsail. Now GoDaddy goes a bit more into detail than just these three options, but it goes to show that they’re focused on your average mom n pop website builder. GoDaddy and AWS are targeting two different markets, and so their support is different. GoDaddy runs their support through the phone primarily and they really focus on helping small businesses and personal website owners. AWS is meant for businesses, so with that in mind you must add on AWS support, with the business support coming in at $100/mo. 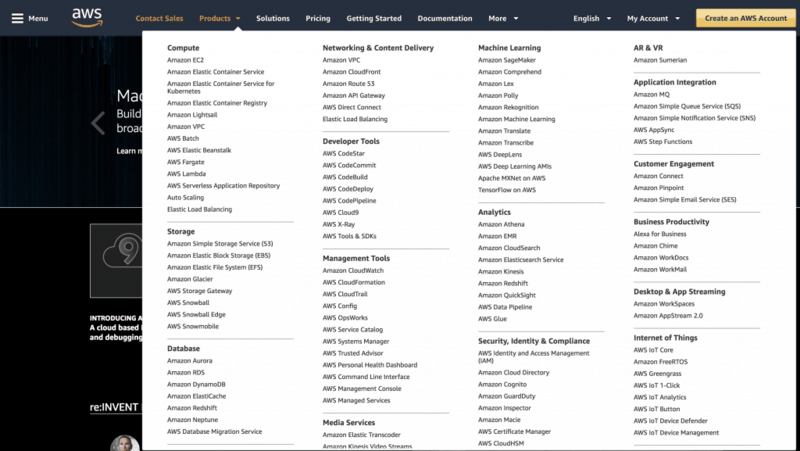 AWS offers a lot of support with their products. Blogs, a contact us link, discussion forums, help, live chats, and support allow anyone to connect with a representative. GoDaddy has online storage, product support, submit support tickets, and transfer a domain. The customer support from both sides is about equal, with different options for you. It’s difficult to say which one is better because they offer vastly different types of support. If you need to connect with someone right away, AWS would be the better option. If you need some support for products, GoDaddy would be the better choice. Both provide quick speeds for running your website. The speed of AWS appears to be quicker than GoDaddy since you can connect with a representative faster. If you’re looking at the rate at which you need your website to run, GoDaddy has some quick speeds to get you up and running. The speeds vary on your needs, but they will work to get you on your way. Neither are a terrible option, so you’re going to be good with either one. If you’re looking for the free year subscription with AWS, the speed is going to be a lot slower than you’ll need. If you can afford the price of AWS, the value would be better. Since you’re getting a lot more disk space with AWS, it may be worth the higher price tag. For a lower price tag, GoDaddy has the better price. You may not get the best features with GoDaddy, but it is certainly easier on the wallet. It all depends on your needs to accomplish your goals. GoDaddy does have more domains transferred or deleted, which means you can lose your site domain easier. You don’t have to worry about it with AWS. isn’t ideal for storing a lot if information, though. The number of transfers in and out of GoDaddy means you may find a domain name faster than AWS. The flipside of that means you can also lose your GoDaddy domain faster as well. More people appear to enjoy the AWS compared to GoDaddy, but they both offer excellent products. AWS has an outstanding uptime, offering up to 100%. GoDaddy has nearly the same, but they come in second at 99.94%. Sites hosted by AWS work for a longer time than GoDaddy, but the difference is almost insignificant. The reason may be in part because GoDaddy hosts nearly a million different sites at the same time. AWS hosts less than 3000 a day. This discrepancy won’t cause your site to crash on either host site. You will get nearly the same results with both, but AWS is the better option if you’re looking for the better uptime. Everyone knows GoDaddy, it’s the Wal-Mart of hosting. It’s on the cheaper end (although not the cheapest long-term), does the job just fine, and has good support. They do things their own way, but GoDaddy is used to that. If you’re interested in comparing AWS to another affordable host, check out our Amazon AWS vs Bluehost post. Or, check out our Bluehost vs GoDaddy post to see how these budget hosts stand up head to head! Reminder: As of 2/25/18 you can get GoDaddy Managed WordPress Hosting for just $1/month with this link (a special GoDaddy Managed WordPress Hosting coupon). This is a SCREAMING DEAL and is not expected to last very long. Apr 30, 2018: Small updates throughout, including AWS support pricing. More legible headers. Feb 25, 2018: Included special GoDaddy Managed WordPress Hosting coupon.